February felt like the shortest and longest month. I’m not sure if it was because we’re just been so busy or because there was literally a snow/ice day every week! This winter has been crazy to say the least. I’m so over it! Bring on spring ASAP. Please! This past month was a busy one! With client jobs on the go, the Self Made Life Podcast, shooting some creative flat lays and visual content with Megan Butchard Photography, and exciting new ventures to come (can’t share just yet ;)), here are a couple highlights from February! I signed up for an intensive 6 week calligraphy course through Quills in Hamilton. I know some of you might be thinking — why would you need to take a calligraphy course?? Don’t know you already do calligraphy?? The answer is yes — I’ve been doing calligraphy for about 5 years now and more seriously over the past 2 years. I’ve been completely self taught and have taken a short 1 day workshop last ysiear. I’m always looking to improve my skills with new techniques. I was also in the process of putting together my own 1 day workshop for pointed pen calligraphy. I wanted to make sure that the information that I was teaching my students was correct and on par with the Calligraphy community. Back to my experience at Quills — I had no idea that you could actually use watercolour and work with it on your nib! It is a big of a process and labor of love. Basically — You need to dilute your solid watercolour paints and create an even consistency similar to the traditional sumi ink. Then, you “paint” the mixture onto your calligraphy nib making sure not to put to much on but filling the vent hole. Then you start writing! You can actually make a cool gradient by mixing and transitioning colours as you go, carefully painting them on as you go. 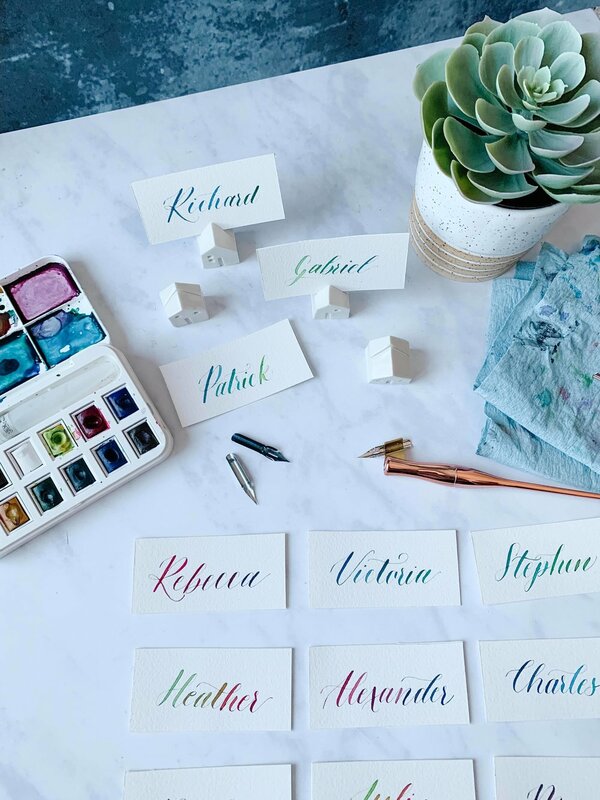 I made up some fun place cards using this technique. So — Something crazy happened. The One of A Kind Show reached out to us to be part of their Spring 2019 show at the Enercare Centre. They contacted us to be part of their Marketplace section. After chatting to some local maker friends about this, they all recommended we shoot for Rising Stars. Rising Stars is a section in the show were you have a free standing booth structure that you make yourself to showcase your work and products. We put together our application and applied not thinking that we would get in. AND we got in. BRB while I panic. It is now less then 1 month to show time and we have A LOT of prepping to do. I’m not sure how we are going to do it, but we’re going to do. It was so funny — After we found out we got in, Tayne texted me while he was at work to show me what he was printing on the press. It was all of the OOAK promotional material. And it was A LOT. Anyways… We will be at the One of a Kind Spring show in the Rising Stars section. Stay tuned on instagram for a pair of tickets giveaway! Emma from Simple Girl Canada came to me with a dream last December. She wanted to release a line in support of International Women’s day. If you don’t know Emma and Simple Girl Canada — You need to check them out ASAP. Emma is the sweetest soul. She is a full time elementary school teacher by day and mega boss babe by night and weekends. She makes custom, semi custom, and uber cute tshirts and sweaters that are 100% Canadian Made, ethically sourced, and sustainable. I have a couple of her items (Hello Sunshine tee, Kindness is Key tee, and the Choose Kindness sweater). I practically live in all of them on rotation, especially the choose kindness sweater. Like I’m talking 4-5 days in a row… is that good. Anyways — Emma and I partnered together to create an item for her spring line that is in support of International women’s day. I hand lettered the word “Inspire” for the line and it is now housed on one of those dreamy cozy sweaters! You can check out the whole line here: Simple Girl Canada and use the code SIMPLYASHLEY10 for 10% off your purchase. Your WELCOME. PS: is it weird if I buy and wear the sweater I designed? At the end of February, I taught my first pointed pen workshop. After months of planning and organizing this workshop — I am so happy with how it went! Of course I was so nervous at first (who wouldn’t be). Tayne actually told me while he was printing the workshop workbooks that he thought it was my best workbook yet! I hosted the workshop at Medium Art Studio in Burlington. We had 12 students and it was the perfect size. During this 2 and a half hour workshop, I taught the group how to properly prepare their materials, how to position their paper, proper posture, and lead them through a series of basic strokes and a modernized alphabet (lowercase and upper case). It was a great group of students and they really picked up the techniques very well. So I turned 28 and celebrated my birthday with family and friends this month. I’ve gotten to the point where I don’t really want to celebrate anymore. Not sure why, maybe as we get older, we don’t really want that reminder? But I have to say, I am so darn lucky to have such amazing people in my life. Thank you for making my birthday special. I’ve teamed up with Mapleview Centre for an incredible campaign. In support of Pink Shirt day and anti bullying, Mapleview set up a gorgeous floral wall with the words Be Kind on it. You can take a photo in front of the display (perfect for the gram). If you share it on your social media (instagram or twitter), and use the #MPVKind, Mapleview will be donating $1 on your behalf to ROCK (Reach out centre for Kids). Participants also received a personalized calligraphy note of kindness. This cause is near and dear to my heart. I was bullied as a kid, teenager and even recently in my adult life. It is never ok to put others down. Coming from a design and advertising background, often times the projects that I was working on really weren’t significant or life changing (hello photoshopping deli meat). I truly feel so blessed with this opportunity to share my talent and gift towards this life changing initiative. How was your February?? What are some of the highlights from last month for you?? Share in the comments below!